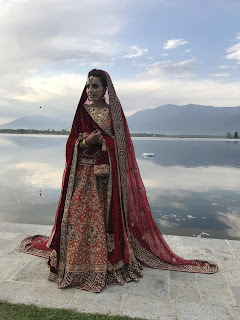 Festival month has begun ‘Osman & Sajida’ a designer label from Kashmir by talented duo Osman Watali and Sajida Nain Watali brings in their exclusive Ethnic collection this festive season. ‘Ethnic collection’ is inspired by the rich Indian Heritage, where these designers have tried to encompass a deep rooted culture from different parts of India. The detailing is also inspired by traditional Indian crafts and includes appliqué embroidery, colour blocking, layering and panelling. ‘Osman & Sajida’ mentions, “Our store stocks carefully selected designs in Pret as well as Couture wear in fashion range. We have woven our thoughts and innovation to create a line of eclectic bridal designs for the confident bride. This festive season get ready to revamp your wardrobe with & ‘Osman & Sajida’s Latest Ethnic Collection now available at their Flagship store. Osman & Sajida was established in 2015. It is a beautiful store that stocks carefully curated women's Pret & Couture range. Our women's fashion collection offers a healthy mix of handsome classics, electric treasures, good quality staples and a few surprises. We endeavour to make our store hub of all things beautiful and exciting offering unique blend of themes and ideas. Apsara Road, Gandhi Nagar, Jammu, 180006.